What surprised me is the humour in the early game introduction, it took me by surprise quite a bit. The writing was brilliantly witty and it totally had my focus. For a post-apocalyptic game set in a very harsh environment, one that's been burned away by two suns and battered by winds, I didn't expect it to be that amusing. It does keep some humour as you go through the game, but thankfully it doesn't go over the top with it. 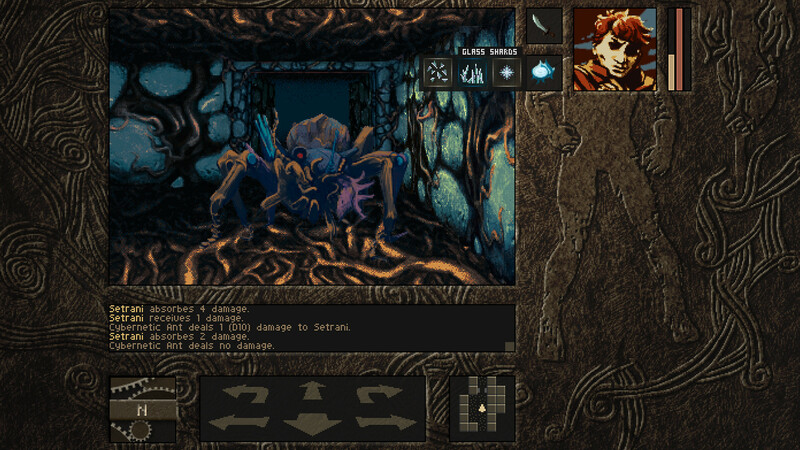 It really does remind me of the classics like Dungeon Master, which I played on the Amiga back when I was much younger. It definitely recreates that sort of experience, with a few modern touches and some fantastic artwork. What I love about it, is that your abilities level up as you use them, so by the end of it my throwing accuracy was rather high. It's certainly tricky too, with the real-time combat you will often find yourself quickly backing away from enemies while they attack, to run back up and give them a whack. It can be difficult, managing multiple characters along with their health due to the real-time nature of the game. You can get an "active pause" feature to help, but that's only available to the lower difficulty. 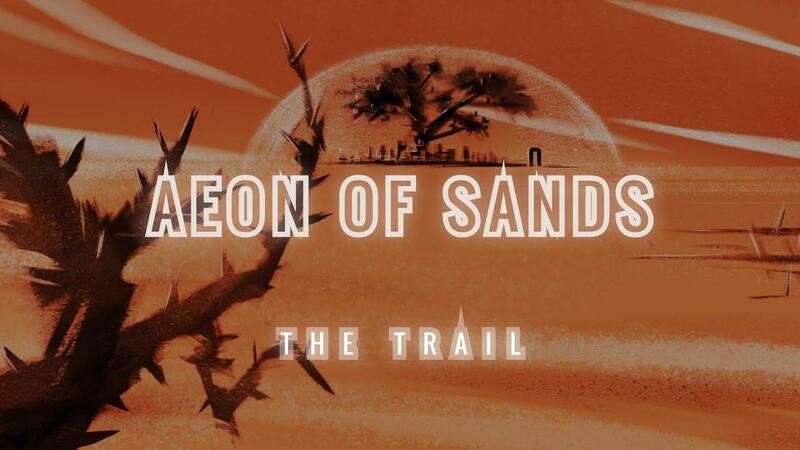 As for the exploration the map is of course an essential part of a dungeon crawler and with Aeon of Sands it's especially so, as often switches and triggers work together to open up various sections for you to explore. To help with that, it does allow you to draw directly on the map with a bunch of pre-defined markers and it's exceptionally handy. I got pretty frustrated with it early-on, with the endless-feeling corridors that messed with my brain but properly making use of the drawing feature sure does make it a lot more satisfying so it's not to be ignored. To make that point about the map clear, I was walking around lost for a good half an hour before marking everything I could which ended up helping me find the one I missed…right by the stairs I entered from—doh! It's not all dark dungeons though, as you also travel to different areas across a world-map and meet some curious characters there too, this is where again it shows off the wonderful writing and makes it quite different to others in the genre. I came across a ruined camp at one point and found a very strange fellow hiding in some sort of make-shift tent. They were a bit…simple in the mind, if you know what I mean. I decided to offer up some of our water, they took a sip and then poured the rest out into the desert—madness! They did decide to join us though since they had nothing left and as it turns out, they had a special kind of magic which sounded fun to add to my party. Onwards we went across the desert, when we came across an oasis. Keen for a drink, as my party edged closer we spotted someone sitting by as if they were guarding it, with a rather dangerous looking pointy stick. While trying to haggle with this person for a drink, I decided to see if they wanted a pet in exchange for a sip (a creature I killed earlier) but they weren't to be fooled by it, so a little frustration later I threw the carcass into the water to poison it and have the last laugh. Things didn't go quite as planned (obviously), as they grabbed their pointy stick, chased me and while running I got surrounded by creatures and forced into a corner where my entire party met their end. Well, serves me right I guess? 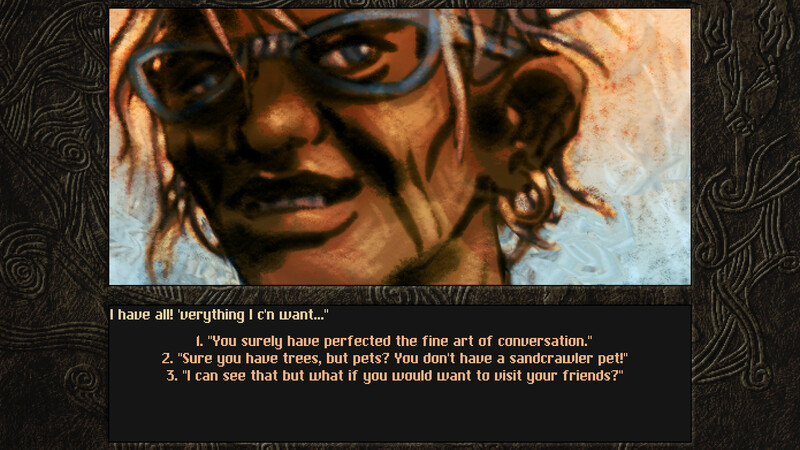 I do also rather like how it gives you choices on how wordy you want the experience to be. While I do love a good story, sometimes I just want to get into the exploration and having the option to do that was really nice. Different choices when coming across people, makes playing through it more than once quite interesting too. The Linux version does run very nicely, it's smooth and no noticeable issues. If you like retro-themed dungeon crawlers I think it's absolutely one to take a look at. Fantastic moody atmosphere that's definitely quite different to the usual, while still being familiar. You can find it on Steam for £16.99/$19.99/€18.99. If you wish to see it on GOG, that's up to GOG so you can vote for it here. Glad you came around to trying it, I sent the dev (one of two) your way. I know him from the love2d.org forums and this game is made in said framework. I have read that it is very much a choose you own adventure game, even though that may not be entirely obvious. Personally I love the art style and hope to be able to play it myself sometime, so please take your time to vote for it to come to GOG. Voted too. The game sits on my wishlist. I was still a bit undecided, but your review made a purchase very likely now! For one, the real-time combat really is the worst of its kind. Some crawlers like that with real-time combat at least manage to be a tiny bit more than just "step up, hit, step back, repeat ad nauseum". This one isn't... how anyone can find this ridiculous, unchallenging routine entertaining is beyond me. How Liam can claim that it "can be challenging" is even more of a mystery to me. My only thought during combat was "make it eeeeeeeeeeeeeeeeeeeeeeeend!" (enemies take quite a few hits). This also isn't a case of "turn-based would've been better", as the enemies are so one-dimensional in what they do it really wouldn't have done much. The other big point is the humor, which of course is a problem to begin with (of all entertainment forms, humor is the most subjective), as it makes your liking of the writing pretty much a 50/50 chance. 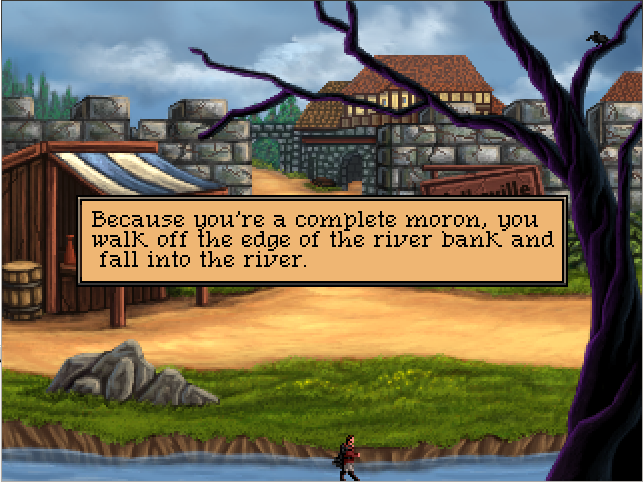 But in addition to that, the humor in this game is of the 4th wall breaking type. Not only does that constantly rip you out of the game world by force, it makes you feel like you're sitting in front of the most cheeky DM possible. Imagine a DM who has nothing but a snarky remark for anything you do. ugh. The game would have been MUCH better if the humor (at least the 4th wall breaking parts, which is the majority of it) would have been left out of the game. TheSHEEEP Not only does that constantly rip you out of the game world by force, it makes you feel like you're sitting in front of the most cheeky DM possible. Imagine a DM who has nothing but a snarky remark for anything you do. ugh. Would you compare it to Quest for Infamy, if you happen to have played that? I did play it, but I didn't find that it had so many 4th wall breaking jokes, but it's been a while. Besides, the whole game is much more of a comedy adventure to begin with. 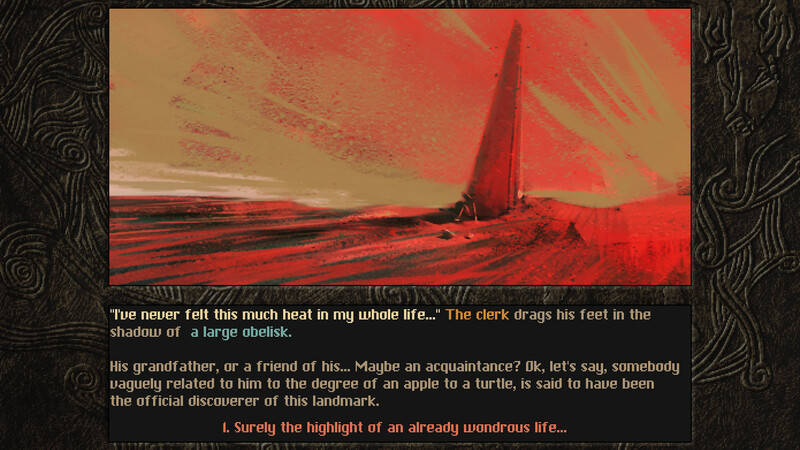 In Aeon Of Sands, there is a stark contrast between normal and humorous writing. When it isn't the "DM" speaking to you as the player, the writing is relatively serious most of the time. Two years ago, I would have been super excited for this. However, an ill-advised attempt to revisit some of my favorite old games (damn you, GOG! You vile temptress!) last year told me that I am not patient enough anymore for this sort of exploration.